So, as a massive fan of the two games, you can probably imagine how honoured I am to announce that Aleksi Eeben has compiled Greenrunner, Redrunner and an enhanced copy of Retroskoi+ on a 64KB cartridge for RGCD. Both games have been fixed for NTSC and PAL machines and the illustrator Miha Rinne has provided a fantastic piece of artwork for the box that I now have proudly stuck on the wall behind my C64. Following on from our successful collaboration on Soulless, we'll again be releasing the updated version of these two games on cartridge, disk and tape with our good friends at Psytronik Software. The L.E.D. illuminated clear cartridge version will retail at £25/26 including Europe/Worldwide shipping whereas the disk and tape versions will sold at a considerably lower price. To sweeten the deal further, the two games will also be freely available to download from RGCD in .PRG and PC-friendly VICE-embedded emulator format. However, the enhanced Retroskoi+ synthesizer with it's collection of additional sound presets and wider keyboard range will remain exclusive to the cartridge version. Expect the game to pop up in our shop (and Psytronik's!) in the next couple of weeks. 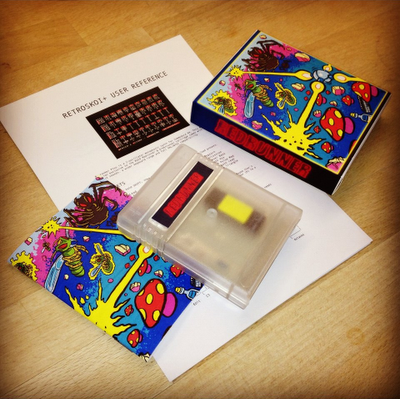 And a great idea to put the 2 games and the Synthesizer on the card.